Lightning is beautiful, but also dangerous and potentially deadly. Strikes have killed an average of 67 people a year for the last 30 years in the United States alone. While most people are struck by lightning outside, you are still at risk when indoors during a thunderstorm. There are three main ways lightning can enter a home: through a direct strike, through the electrical wiring, or through the water pipes. No matter how it enters, once lightning breaches your structure it can travel through your appliances and plumbing. Stay away from the windows – Windows provide a direct path for lightning to travel. Keep windows closed and stay in interior rooms away from windows. Don’t use corded or charging phones – Although most households have ditched the corded phone, they are still a significant danger during a lightning storm. 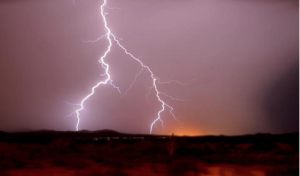 Lightning can enter your home through your phone lines, striking anyone using the phone. Landline phone use, especially in rural areas, is still the leading cause of indoor lightning injuries in the U.S. Since lightning can also travel through your electrical wiring, do not use a cell phone during a storm if it is plugged in. Avoid contact with concrete floors and walls – Concrete flooring and walls – such as those that make up garages and basements – contain metal reinforcers which can then conduct a lightning strike to anyone in contact with the concrete. Washing dishes can wait – Water is an excellent conductor of electricity. It is advised you refrain from contact with your plumbing, which means no hand washing, no laundry, and no showers. Protect your appliances – Despite popular belief, surge protectors cannot protect your appliances from lightning damage. Unplug easy-to-access, high priced appliances (computer, TV, etc.) BEFORE the storm arrives: you should not touch any electrical outlets while a storm is nearby. Lightning can travel miles through power lines, meaning a strike miles away could reach your house, your property, and you. Stay inside – Even if the weather seems to have cleared, you could still be at risk. Wait at least 30 minutes after the last clap of thunder before venturing outside. For more information on how to protect yourself from lightning, both inside and outdoors, there is a list of helpful tips on the CDC website. If your home has suffered a direct lightning strike or has been damaged by residual electricity from a nearby strike, call Farryn Electric today. We can inspect your electrical system for damage such as melted wires and make any necessary repairs. If you are worried that your electrical system is out of date or in need of repair, we can give you a free estimate on a system upgrade. We also offer generators so that you never have to worry about power outages from severe storms. For all your electrical needs, call Farryn Electric at 484-316-0449.